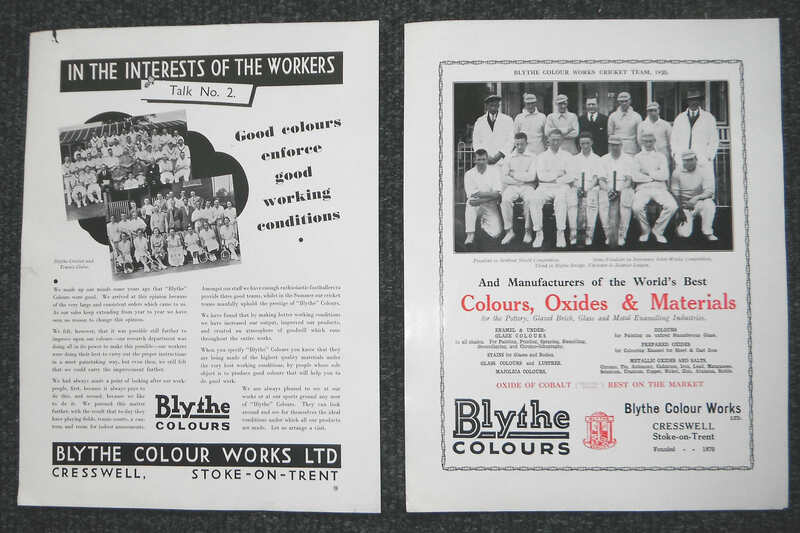 Ex-employees of the Blythe Colour Works factory will be interested to know that there is a Blythe-Colours ‘memories’ session in Cheadle in a fortnight. You’ll remember that over a hundred years of colour-making came to an end in Cresswell last year, when Johnson-Matthey finally upped sticks and left the Blythe Park site. Johnson-Matthey had bought the Colour Works back in 1963 when the site was at the height of its production, but dropping demand had seen the workforce shrink and shrink over the years. However, thousands of local people worked at the Colours at one time or another down the years, so the mention of the place still brings back memories. One thing that was good was that Johnson Matthey passed all the Cresswell site archives over to the Cheadle History Centre earlier this year, so that historians who want to study local industry would have full access to the files. However… lots of the archive material is not properly labelled; and this is where former employees can help. If you worked at the Colours site – or someone in your family did – would you be happy to go along to the session and try to identify the faces in photos, take a guess at what year posters were created, or even try to remember who was who down the years? The session at Cheadle History Centre (in Cheadle High Street) is open to all; and takes place on Friday 13 November from 11am to 3pm. If you can’t get along on the day, email us – and History Centre volunteers will try to get to see you instead! In Draycott & Cresswell, planning matters seem to come up nearly every month! The last big application here was for a solar-panels complex at Draycott Cross – which was supposed to have been discussed at last week’s Staffordshire Moorlands Council planning-committee meeting. However, according to the Moorlands Planning Committee agenda, the application was withdrawn at the last minute. The proposal didn’t look like it was ever going to get approval, so it may well be that the applicants (Solstice Renewables) have decided to rethink their plans – and may submit them in slightly altered form in the future. As for the other big planning controversy, the question of the 168 new homes for Cresswell – which has still not got full approval for its S106 ‘community conditions’ – this is still something that some residents think can be defeated, even at this late stage. The VVSM community action group has pulled together a lot of concerned local people and is pressing on with its campaign to stop the development in its tracks. They are busy fund-raising right now! To see the latest updates on their campaign, click here. 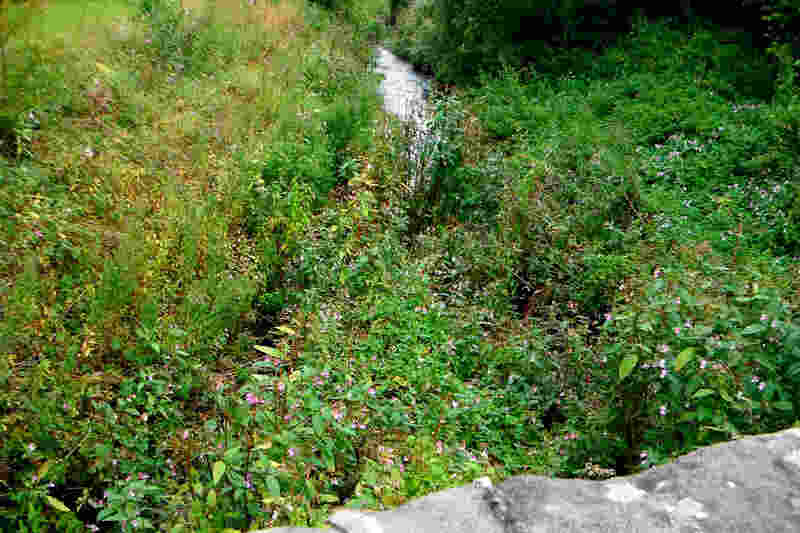 The Churnet Valley Partnership, which looks after the natural ecology of the Churnet, keeps sending us emails about the “threat of Himalayan Balsam”, a weed which spreads like wildfire, and can choke up water-courses. We didn’t realise just how prolific this plant is until we had a look at the flow of the River Blithe under Cresswell Bridge last week. The river is struggling to get along. Roger Holdcroft, one of the new Draycott parish councillors elected in May, is keeping his election promise to try to reach out to local people. He’s decided that he will hold an open session every third Monday of the month at the church hall from 6.45pm-7.15pm, when he will be available for chat, discussion, general queries etc. A number of parish councils (and MPs) hold these ‘surgeries’, so it’s good to see a parish councillor in Draycott making a similar effort. Let’s hope a few other councillors will join him at the session, and so keep their election promises too. Talking of the parish council, a petition came before the last parish council meeting requesting the demolition of the phone-box in the Draycott lay-by (opposite the Draycott Arms). Of course, such a decision is not up to the parish council, as the kiosk is still owned by BT, but, if they did decide to support the petition, that would add a lot of weight to the request. What do you think? Should the phone-box be taken down? Blythe Colour Works archive – saved! When the ceramics & chemicals company Johnson Matthey decided to closed down its base in Cresswell last September, some of us wondered: what will happen to the historic archives? The Johnson Matthey business was better known to all of us as ‘Blythe Colours’, which created and maintained the factory that sat alongside the railway in Cresswell for over 100 years; and employed many thousands of local people during its lifespan. It had been very much a ‘paternalist’ sort of family-firm up until the takeover by Johnson Matthey in 1963; and we owe the present-day cricket club, tennis club and bowls green to the support of the old Colour Works. What would happen to all those precious memories, such as the archive of photos of works-outings, copies of staff magazines and even promotional material? In its own way, all that material is unique as a record of the past. A couple of us on this website took it on ourselves to start a dialogue with the Human Resources Department of Johnson Matthey, and to plead that the archives be not only saved, but handed over (after suitable vetting of course…) to the people of Cresswell. We are happy to say that Johnson Matthey were incredibly responsive to our pleas, and took them very seriously. The big questions from JM were: what ‘responsible’ body would take legal possession of the material? ; how would they ensure open and proper access to the material? ; and where could it safely and permanently stored? To be fair to JM, those are fair questions; and at one stage in the negotiations it did look like the only answer was that the archive might go to the Hanley Record Office. Draycott Parish Council did not express interest, so things were looking a bit forlorn until… in stepped the Cheadle Historical Society – our saviours! Mike Plant and Andrew Bull from the society had also spotted that the Colours archive must be full of material of great importance to local amateur historians, so they came up with the best solutions. 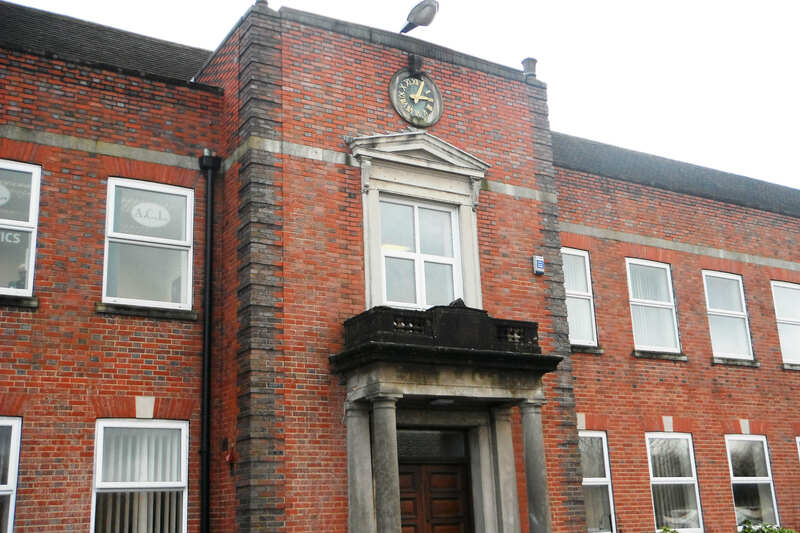 What they proposed was that the archive would be taken on by them as a legal body, and stored at the Cheadle History & Discovery Centre (in Lulworth House, in Cheadle High Street). Johnson Matthey mulled over that proposal for a couple more months… then said yes! Well, after the initial sorting, it’s hoped that a group of former Colours workers, many of whom still live in Cresswell, will be able to look through the material. A lot of it is just stored loose and not labelled, so their memories will be massively important in helping to identify what is going on in the papers and photos. Cresswell resident Barry Phillips, who is an amateur historian himself, will lead that effort. 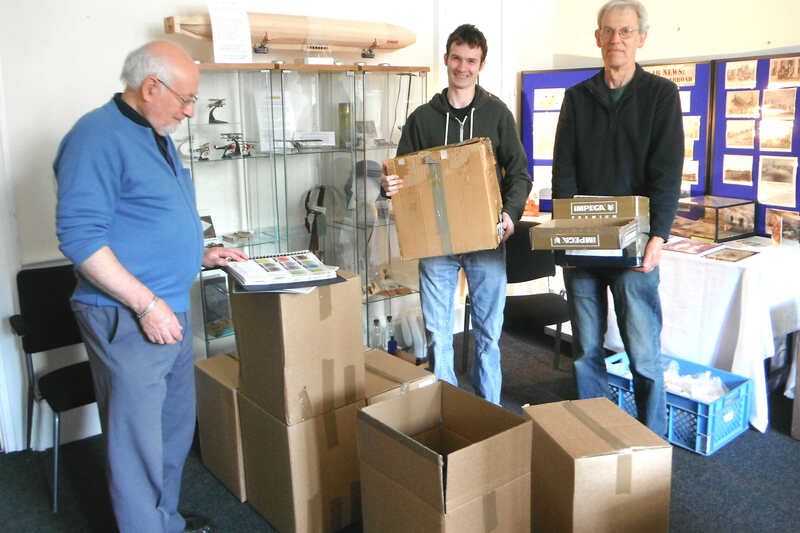 After six months, it’s hoped the archive will be in a well-ordered state… and then there will begin preparations for a public exhibition, in Cheadle, to take place sometime next year (hopefully). At this stage, ‘serious’ historians, especially those interested in local industry, will also be able to apply to the Discovery Centre for access to the material for in-depth studies. And then – wouldn’t this be great? – it’s hoped to take some of the most interesting items and put on an exhibition here in Draycott & Cresswell, especially for local people. So, a valuable piece of Cresswell’s past has been saved, and may give rise to even more memories and more facts about our community’s history as time goes by. And there has to be a big thank you to Johnson Matthey. Way back, in the Colours hey-day of the 1920s and 1930s, the firm prided itself on ‘looking after’ its workers, and made special efforts in that respect. Well, the present-day heirs of the old firm can also congratulate themselves for their community spirit. Many large firms would have just said no to our pleas, either because they couldn’t be bothered to vet the material, or because they didn’t consider the local community important enough. 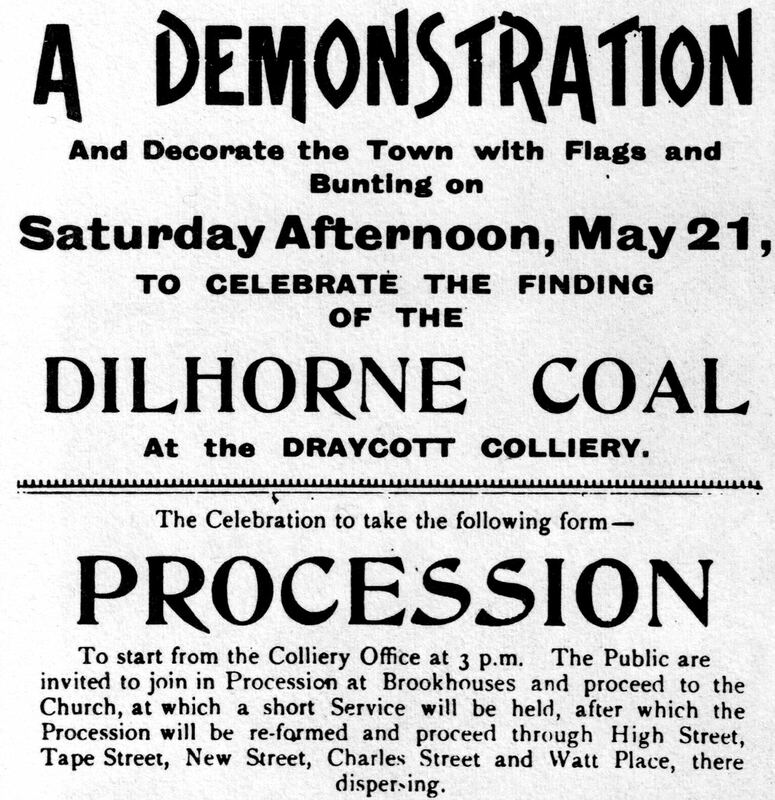 Was there coal in Draycott Colliery? History – even recent hstory – is not as detailed as people like to think. The old Draycott Colliery was to be found on our side of the hill, at Draycott Cross – roughly, just before where the Huntley Wood Outdoor Centre is now sited. On the opposite side of the hill, the Cheadle side, was New Haden Colliery. Draycott Colliery was a stop on the former railway track from Cresswell to Cheadle, but, despite that advantage, it wasn’t very successful, and closed not long after opening, in 1906 – though, later, there was some thought given to creating an additional siding on the same land to make a storage area for railway wagons. It was owned by the same company that owned the railway line, which is why this procession route goes from Draycott and then down into Cheadle town centre. The site may also have been the site of outcroppings (illegal coal-scavenging) during the 1920s General Strikes. So… in fact, this poster presents a bit of a mystery. It clearly claims that coal from the Dilhorne seam had been found at the mine. …or does it? Was this procession perhaps a ‘stunt’ – some massive confidence trick – to persuade investors to put money in.? Who knows? Draycott Colliery was not quite finished however – as the site was later taken over by the Water Board, with a proposal to build a reservoir. The shafts sunk for the colliery were the basis for the Water Board’s bore holes established in the 1940s. You can still see, from the side of Cheadle Road, a water pumping station that is still in use. This poster will be featured in an exhibition at Cheadle History Centre, due to take place in autumn this year, which will be all about local industry during the early twentieth century and especially during the Great War time. And this is where you can help. Do you have letters, documentation, photos or artefacts (relating to mills, mines and factories) that date back to that time? Cheadle Centre would dearly love to hear from you. Just contact Cheadle History Centre – or email us, and we’ll email you back all the details you need to know. Want to comment? Just use the comments box – near the bottom of this page. (The comments form will ask if you wish to put in your email address. You don’t have to, and it is always kept private anyway and never published, but, if you don’t add your email, that means you might miss any responses to your comment).